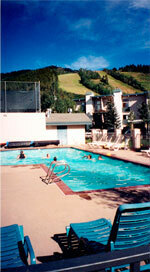 The Storm Meadows health club sits on the slopes of Mt. Werner in Steamboat Springs, Colorado. 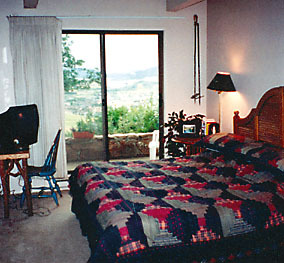 With exceptional views of the surrounding valley and mountain ranges, these accommodations add to AFTS's stimulating vacation retreat. 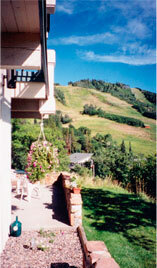 Walk out your door to the beauty of Steamboat Springs. Take a gentle walk in nature or if you are looking for a more vigorous challenge, there are many hikes from which to choose. Participants stay in one and two bedroom condominiums that provide spacious, comfortable living quarters with exquisite views of Mt. Werner and the valley below. 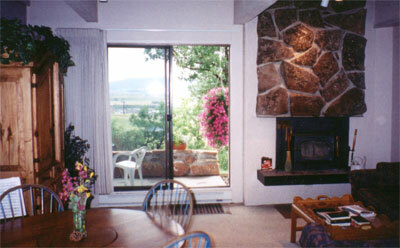 Condos include shared kitchens, living rooms, fireplaces and outdoor patios or decks. Morning classes are held in condo living rooms. Click here for more information about Storm Meadows Club Condominiums. There are both single and double bedroom condos available. Every bedroom includes a private bath. The condo complex has a well-appointed health club that includes pool, spa, gym equipment and sauna. Full kitchens are available in all condos for participants to prepare their own meals. Several of Steamboat's fine restaurants give discounts for all Arts for the Soul's participants. Steamboat Springs, Colorado is located in the majestic Rockies. It is filled with things to do in the afternoon free-time periods, like taking hikes, shopping, visiting art galleries and more. Visit www.steamboat-chamber.com for more information about Steamboat. Lovely bedrooms with views too! Arts for the Soul is proud to be an affiliate of the Steamboat Springs Arts Council, the Yampa Valley Community Foundation and the Steamboat Springs Chamber Resort Association. Page delivered in 0.00182 seconds. Copyright © 2019 Arts for the Soul, LLC.